Hello all, sorry for the lateness of this Sunderday post. I had 60 kids over yesterday for my children's birthday party and so I've had a bit of a full weekend (and I’m still getting the hang of this blog thing), so I'm keeping it short and sweet. Today I have something simple for you. It’s another niche shield that’s useful for anyone who wants to do a bit of underhanded shenanigans and doesn't want to be found out (or that “good” fighter that just joined the party that told you he likes cute bunnies and long walks on a moonlit beach with his true love). I hope a GM’s BBEG finds a use for it somewhere, somehow to try to put one over on the party. Slot shield; Price 40,150gp; Weight 22.5 lb. This plain unadorned +2 Heavy Shield is made out of lead instead of steel. This halves the item’s hardness, although its hit points are unaffected (Hardness 7, Hit Points 40). It also adds another 50% to its weight (22.5 lb.). 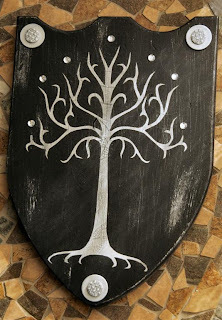 The bearer of a Lead Shield is immune to the effects of any Divination spell of 3rd level or lower, including spell like abilities and similar effects from items. The shield must be held for this ability to be active, although being strapped to the bearer’s back does count as being held. Hello and welcome to this week's Frightful Fridays! 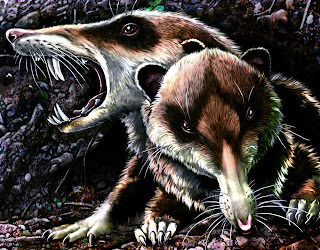 This entry is courtesy of my good friend, Brian, who figured I'd like this very cool prehistoric rodent. Since I wrote up the squiger not too long ago, I've been sitting on this squirrelly terror, but I have wanted to put something out there as a druid animal companion. I hope you enjoy this Frightful Friday! offering. I will be off next week preparing for something special in April regarding this feature, but my friend Paris Crenshaw is making sure you won't go without. I got a sneak peek at his monster, and I think you'll really like it. This large rodent turns away from its kill and bares surprisingly long fangs. Dense Fur (Ex) A saber-toothed squirrel has exceptionally dense fur, which helps it survive in colder climates. While the fur does not provide any natural armor for the squirrel, it does give the squirrel cold resistance 5. Vicious Teeth (Ex) A saber-toothed squirrel has sharp teeth that deal triple damage on a critical hit. A saber-toothed squirrel is highly territorial, and equipped with razor-sharp, 4-inch long teeth that allow it to protect its territory from animals twice its size. The squirrel is 3 feet long, including its twitchy tail, and it weighs 25 pounds. The foul-tempered saber-toothed squirrel makes its nest in a sturdy tree, and the squirrel will launch itself from the tree’s lower branches at animals or humanoids that approach too closely. This rodent is carnivorous, and if it becomes hungry enough, it will attack prey much larger than itself, including unwary humanoids. Fortunately, the squirrel is easily distracted by shiny items, so someone faced with this fanged menace can avoid a confrontation by dropping a copper piece and running away. Saber-toothed squirrels remain active throughout the year, thanks to the protection provided by their thick fur, which the squirrel sheds in great clumps when the temperature warms up. Starting Statistics: Size Small; Speed 30 ft., climb 20 ft.; Attack bite (1d4); Ability Scores Str 12, Dex 16, Con 12, Int 1, Wis 14, Cha 8; Special Qualities cold resistance 5, low-light vision, vicious teeth. 4th-Level Advancement: AC +2 natural armor; Attack bite (1d6); Ability Scores Str +2, Dex +2, Con +2; Special Qualities cold resistance 10. Everyone knows that the ruins on Delirium Bluff are haunted. Once home to a local merchant and his family, the house christened Red Raven Hall was unknowingly built upon a complex of subterranean ruins. One night the vile residents of that forgotten place rose up and laid waste to the merchant's house. The walls were bathed in blood and the innocent suffered heinous torture before they were finally granted death. Strange lights and ominous noises have kept the wise away from that unlucky place ever since. But reports of increased activity have led some to fear that the foul denizens of the deep have returned to the shattered manor house. A Conclave of Ravens is a location-based adventure for character levels 1-3, inspired by the works of Lovecraft and Clark Ashton Smith. 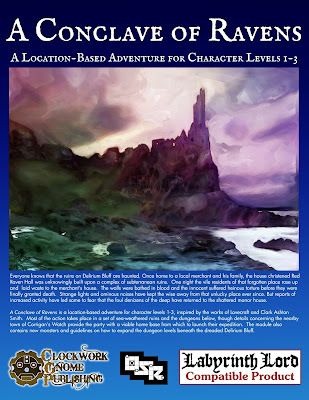 Most of the action takes place in a set of sea-weathered ruins and the dungeons below, though details concerning the nearby town of Corrigan's Watch provide the party with a viable home base from which to launch their expedition. 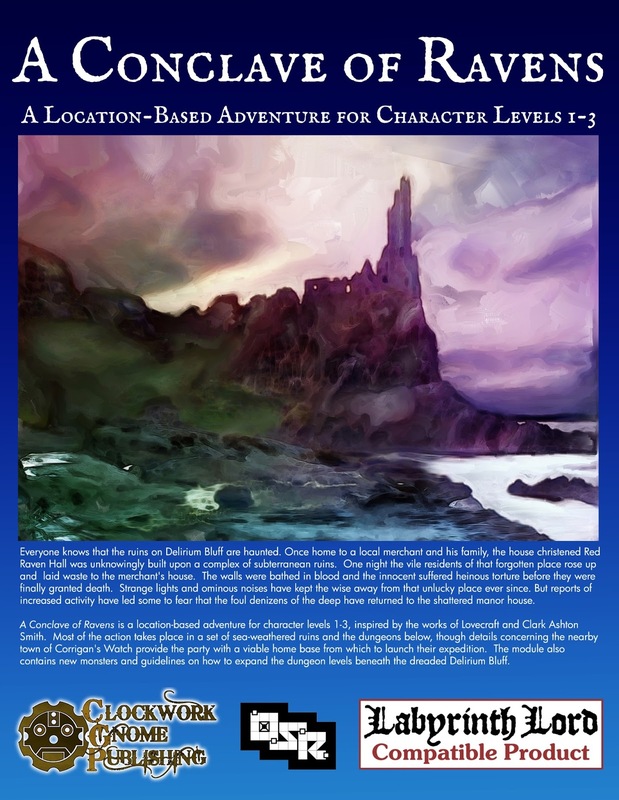 The module also contains new monsters and guidelines on how to expand the dungeon levels beneath the dreaded Delirium Bluff. Southeast of Winter's Horn is the Dreaming Forest, a shadowed land of dense woods and secluded groves. According to local legend, it is home to dark fae, enigmatic elves, and strange magic. But it is also the subject of compelling rumors that speak of unimaginable treasure and forgotten secrets from the days when the world was young. The Dreaming Forest tests the sanity and resiliency of outsiders. However, the chance of winning wealth and fame have a way of calling to those willing to risk their lives in the pursuit of glory. 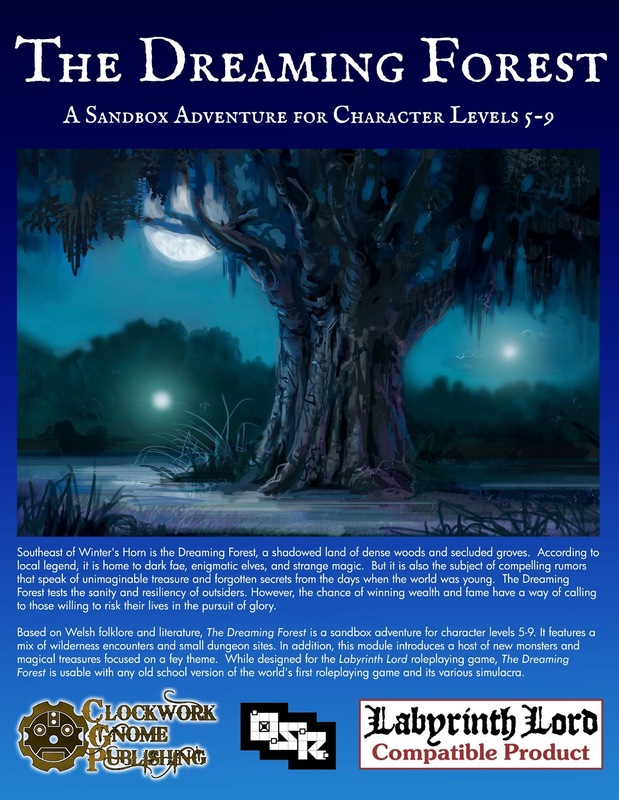 Based on Welsh folklore and literature, The Dreaming Forest is a sandbox adventure for character levels 5-9. It features a mix of wilderness encounters and small dungeon sites. In addition, this module introduces a host of new monsters and magical treasures focused on a fey theme. 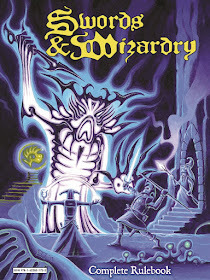 While designed for the Labyrinth Lord roleplaying game, The Dreaming Forest is usable with any old school version of the world's first roleplaying game and its various simulacra. From the heart of the primordial forest. Cousins of the treants and guardians of the woodlands, the arborlings are a plant-like race of humanoids that stand outside the boundaries of civilization. They are deliberate and straightforward creatures who remain the constant enemy of those who seek to despoil the world or unduly tax the resources provided by the forces of nature. 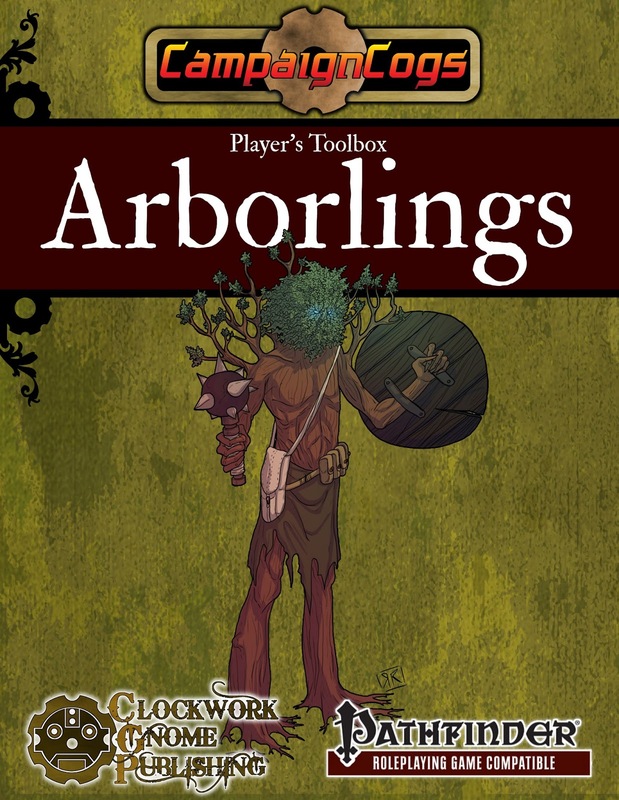 While arborlings are generally isolated creatures, remaining safe in their ancient homelands, a few have heard the call of the adventuring life. And now they stand poised to bring the power of nature to the bear against the evil forces in your campaign! 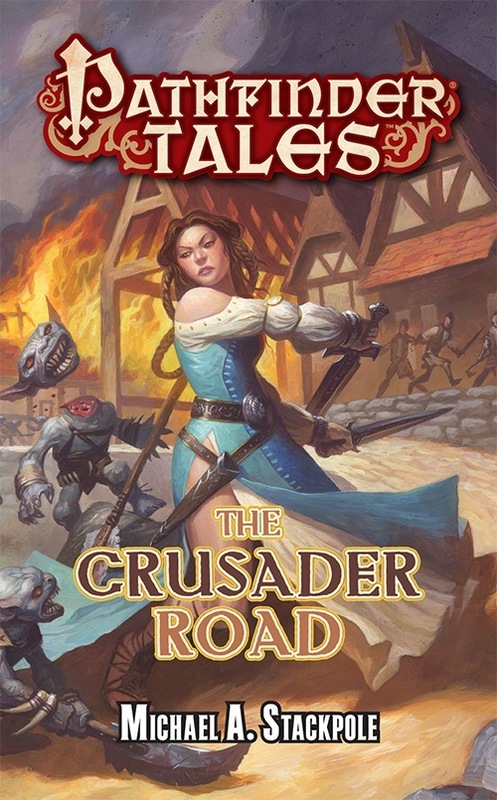 While designed for the Pathfinder Roleplaying Game, this book can be effortlessly used with the 3.5 edition of the World's Oldest Roleplaying Game. 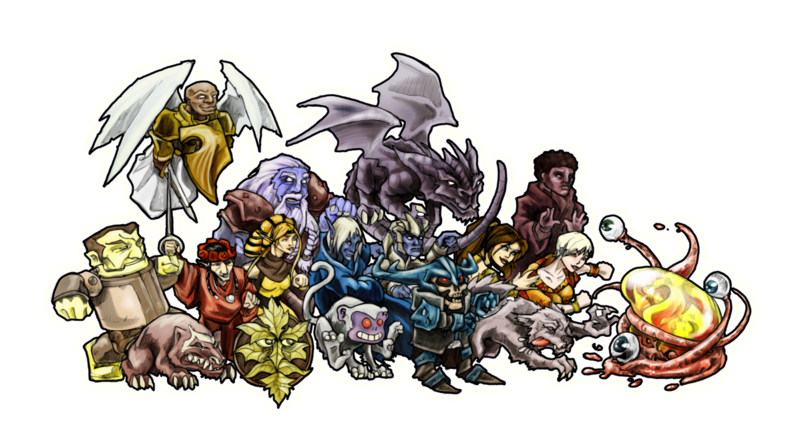 ñ A complete standard race (10 racial points) that utilizes the Pathfinder Roleplaying Game Advanced Race Guide format. ñ Six alternate racial traits and six alternate favored class options. 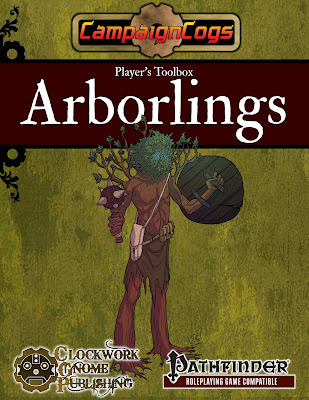 ñ New equipment and two new magic items designed specifically for use by the arborlings. ñ Four new feats and three new spells. ñ A racial archetype available that embodies the features of this new race. ñ Includes two versions of the book; a color copy suitable for screen viewing and a bare bones, art-free copy and contains files for use with Lone Wolf Development's fantastic Hero Lab software. The denizens of Faerie look longingly upon the children of the material world. Exactly why they choose to kidnap mortals remains a mystery, but those who are taken are rarely seen again. In their place, the fey often leave behind one of their own, transformed to appear exactly as the stolen victim. Many of these faerie changelings are raised by the ignorant mortals and eventually lose their connection to the fabled Faerie Realms. But when the faerie changeling reaches maturity, everything changes. A complete advanced race that utilizes the Pathfinder Roleplaying Game Advanced Race Guide format. Five alternate racial traits and six alternate favored class options. 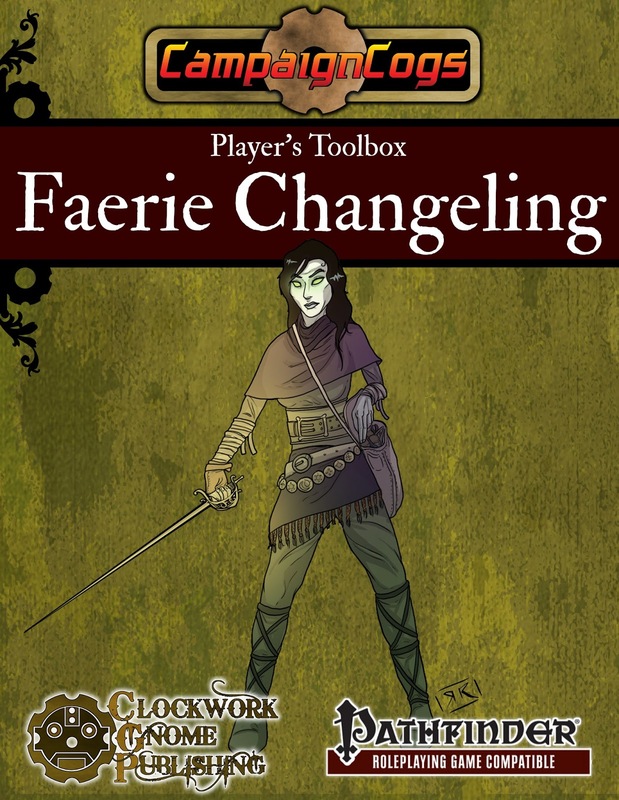 Four new magic items designed with the faerie changeling in mind. Three new feats and five new spells. A racial archetype that embodies the features of this new race. 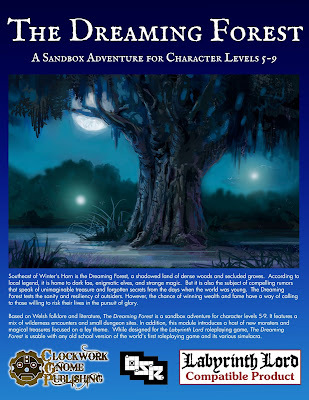 Includes two versions of the book; a color copy suitable for screen viewing and a bare bones, art-free copy and contains files for use with Lone Wolf Development's fantastic Hero Lab software. I have a treat for you today, something that I’ve only discovered the versatility of in the last few years, despite 25+ years of gaming. To me a shield was always a tool, much like a weapon but with less variety, and never really something that stood out as useful for anything more than extra AC for a melee character. All this changed a few years ago (probably about 3-4 years under the 3.5 rules) when I made an Azerblood Fighter (Tank) by the name of Jock McStrap (yes, it was a joke name but this is a rare thing for me and I was playing outside my comfort zone at the time). He had a fairly high Constitution, I think it was about 24 by 8th level, and as many of the feats that gave him more hit points or AC as I could stack on him. Since he was built to take punishment, he also needed a high AC, and after looking through the special shields I came upon the Spined Shield and was instantly smitten. A shield that doubled as a ranged weapon (something that my Dexterity challenged character didn’t have) was A-OK in my book and so with my GM’s permission I added on as many extra pluses as I could afford with my starting gold (he was a replacement for my previous character and so started at 8th level) and thus my view of shields was forever altered. He went on to miss waaaaay more times than he actually hit with the spines, but that never deterred him (or me) from using it. So now when I make a character who can use a shield, I look beyond its AC bonus and try to see whether or not I can find other uses that will complement the character I am building. To this end, I now present a new column for you here that I hope will give you some extra versatility when rolling up your Pathfinder Fighter or Paladin, Druid or Inquisitor, Cleric or Cavalier or any other concept that you imagine. 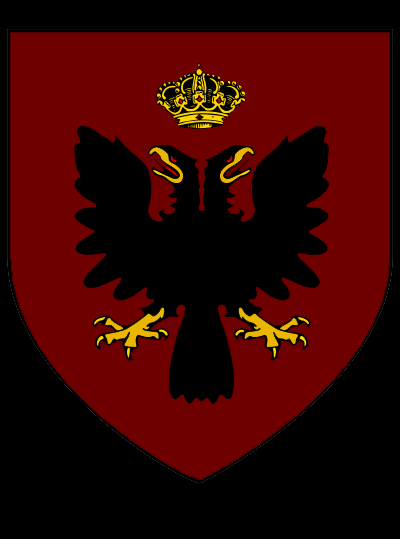 Thanks to Theodric, each Sunday I’ll give you a new shield and I hope that you enjoy them and can get some use from them. And as an added bonus for my first week, I’m also gonna give you a new shield Magical Property as well. The reconnaissance shield was devised by a wizard general during a massive civil war to help his scouts get close enough to the enemy camps to gather useful information without getting caught. After the enemy commander learned of the tactic, he ordered large cleared areas be made around their campsites, but despite this sound order enough of his tactics and troop movements had been gleaned by that time to lead to his eventual defeat. Slot shield; Price 22,150gp; Weight 45 lb. 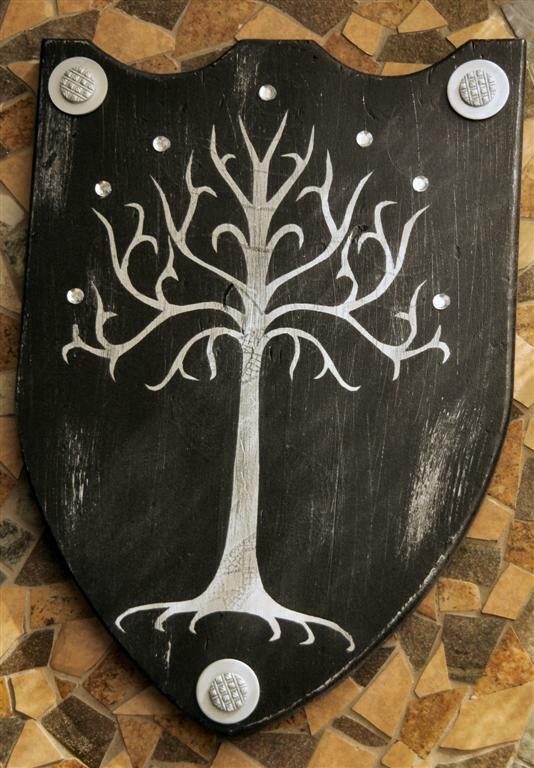 This +1 Tower Shield looks like any other wooden shield of its kind, except for the carved leaves along the front border. It is used primarily by armies and forest scouts as a useful device for spying on enemy encampments. While Proficiency with Tower Shields is needed for normal use, its other power can be used by anyone without penalty. Three times a day, the wielder can crouch down behind the shield and make the image of a tree appear around herself. This illusion acts as a major image in all ways, save it is centered on the shield and cannot be moved. The tree can be made to appear as any kind the wielder wishes to blend in with their surroundings and can be any height from 10-20ft. A viewing slot in the shield (undetectable from the front facing) can be opened up once behind the shield so as to spy upon whatever the user wishes. 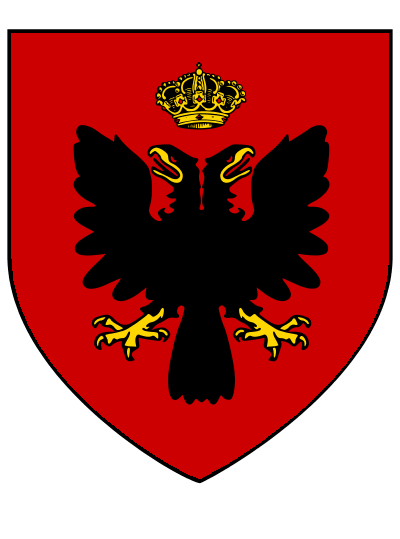 The duration lasts for as long the shield is held, although movement in any direction of more than a foot from the spot the illusion was first enacted also cancels the effect. Originally developed by a magus who employed a shield as his weapon of choice to confuse his enemies, this special ability has made its way into general use, although its cost means it is still quite rare. Invisible: A shield with this special ability can be made invisible at will as a swift action. This invisibility lasts for up to 10 rounds, after which time it becomes visible again. The wielder can make the shield visible again at any time during the 10 rounds as a free action. Once the shield has been made visible, it cannot become invisible again for a number of minutes equal to the rounds it was invisible. While active, an invisible shield gives it’s user a +5 bonus on bluff attempts to feint in combat. It also imparts an additional +2 deflection bonus to AC while it is active, as your opponent is never quite sure where your shield is positioned. Strong Illusion; CL 9th; Craft Magic Arms and Armor, shield, greater invisibility; Price +3 bonus. New! Sunderday from Down Under! New Feature! New Guest blogger! Warriors, get more out of your shields! You may have noticed Flash cxxi quietly added to the author roll this week. 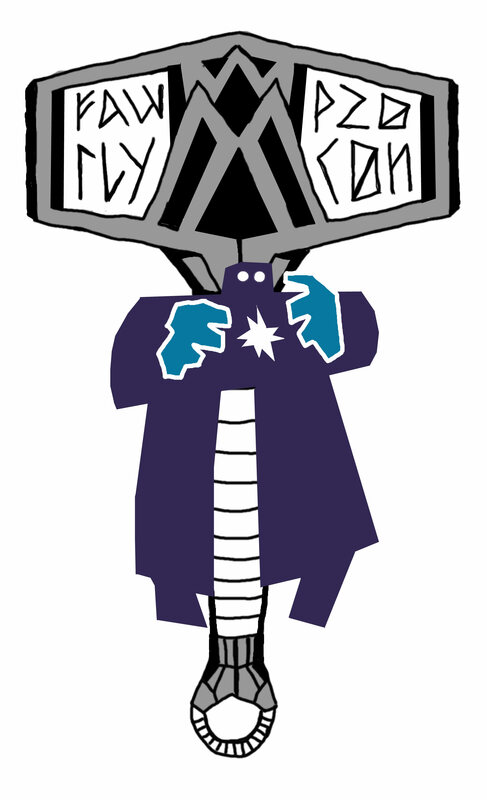 He's another friend I made over the years thanks to the Paizo boards, and in particular, the [in]famous FaWTL threads (in Off Topic -- what could this mean?). 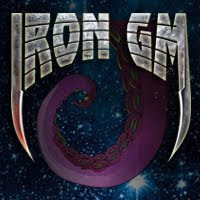 This thread has produced a publisher, authors, artists, an RPG SuperStar and RPGSS placers over the years -- not to mention innumerable laughs, curses, and brilliant ideas. They've been a wonderful source of support and friendship to me, in-blog and off-blog. Flash is the most recent in this fawesome line of Fawtlies to go from reader to contributor. He will be offering a feature that focuses on shields, and he is the first contributor from outside the US: Australia, represent! Tune in later today for his first post! All hail IssacX! When Patrick pointed out this illustration of a monstrous land-walking angler fish, I had to create a Frightful Fridays! entry from it. In keeping with the sources, the behemoth teleost uses its lure to attract prey, but it will chase down those who resist its lure. I had a lot of fun working on this creature, and I hope you like it as well. See you next week! A light cuts through the darkness slowly revealing an enormous creature that looks like an angler fish attached to an elephantine body. Teleost Withering Disease (Ex) Bite; save Fort DC 24; onset 1 day; frequency 1 day; effect 1d6 Str damage; cure 3 consecutive saves. The save DC is Constitution-based. Light Lure (Su) A behemoth teleost can activate or deactivate its lure as a free action. The lure cuts through darkness of any kind, including that created by deeper darkness. Any creature within a 300-foot radius of the lure must succeed at a DC 23 Will save to avoid becoming entranced by the lure. 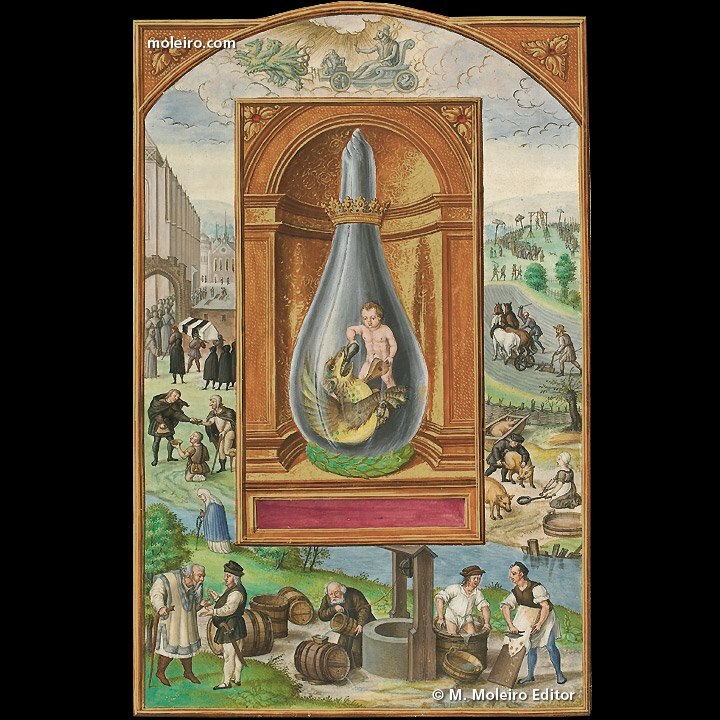 Those who successfully save are not subject to the same teleost’s lure for 24 hours, but those who fail move toward the teleost using the most direct means possible. A victim passing through a dangerous area receives a second saving throw to shake off the effect. If anything attacks an affected victim, the effect automatically ends. This is a mind-affecting charm effect with a Charisma-based save DC. Resilient Lure (Su) The lure is treated as having SR 30 with respect to spells or effects that would extinguish the lure’s light. An eating machine that prefers to lure its prey to itself, a behemoth teleost is capable of depopulating square miles worth of land when it embarks on its short-term binges. A typical specimen measures 15-feet in all dimensions and weighs two tons. Dread krakens were not content to create only underwater abominations; after all, their most likely enemies lived on the surface. So, they crafted the behemoth teleost, a predatory creature that would call forth darkness that so easily frightens surface dwellers, but then would offer false hope and ultimately death to those who fall prey to its lure. Like other predators that consume multiples of their own weight, a behemoth teleost feeds for a week and then falls into a deep slumber for months at a time—after burying itself deep within the earth. A hunting teleost finds a spot near a well-traveled path where it creates pockets of deeper darkness and then activates its lure when it senses the approach of potential prey. 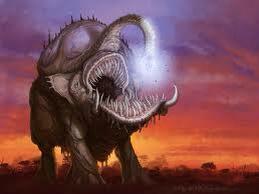 The creature also buries itself just below the ground’s surface and extends its lure above the ground to attract prey. While reasonably intelligent, a teleost fights to the death when it is hungry (which is almost always). 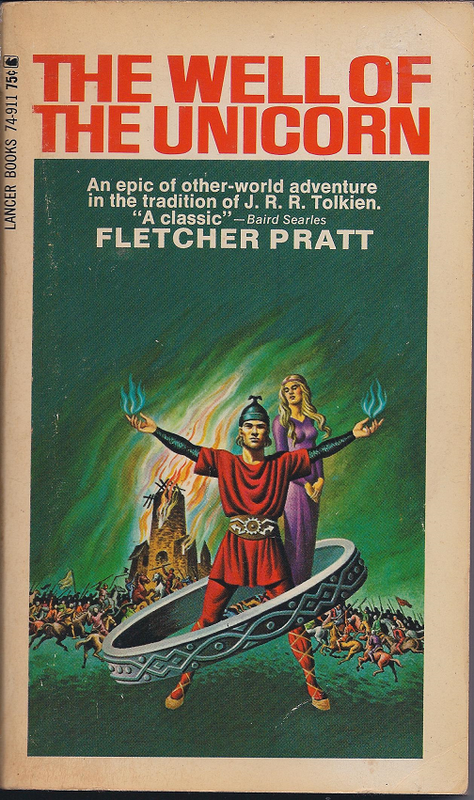 It might not be obvious how this belongs in Tomeful Tuesday, but I'm actually asking for help I'm not finding in the books I have -- or online, for that matter. I had a one player game Saturday night due to some unfortunate circumstances with the other player, so there was lots of time for him to get to know Waterdeep. (I'm having fun bringing my own versions of local NPCs to life.) It's a dance of making stuff up and reinterpreting to suit myself and the game, but also wanting to have a sense for myself and the players of what the shared experience of Waterdeep is for gamers and readers. Zzar is the margarita of Waterdeep, culturally speaking, says this Texan. There's an accepted description of how it tastes: a dry white sparkling wine fortified with almond liqueur. So I was surprised to not be able to find a description of how elverquisst -- the almost totemic elven wine in the Realms -- tastes. How is that not in Volo's? Or E.G. Presents the F.R.? Or in the F.R. Wiki? Are things elvish so ineffable? Any setting sommeliers out there who can help a brother out? It's time for another Frightful Fridays! feature. I apologize for missing last week's update due to illness, but it was for the best, since my thoughts would have turned to evil phlegm monsters or something. Instead, this week, you get an evil monkey monster and another not-so-evil kaida. The akumasaru is a monkey from Hell that takes the idea of the mischievous monkey to an extreme. I envision an adventuring party stopping in a town where everyone is carrying around these cute, little critters (they can shapechange) and being weirdly protective of and doting towards these pets. If the party uncovers the truth, the akumasaru-influenced villagers threaten the characters and make it clear that the characters will have to kill them to get to the akumasaru. The flask kaida is Neutral, rather than Good like its page kaida cousin, but that's due to the fact that sometimes it ends up protecting poisons as well as potions. Despite its somewhat corrupt morality, a flask kaida is a wonderful addition to an alchemist character or an arcane spellcaster who might get a friendly potion-maker to accompany her. I hope you enjoy these latest Fright Fridays! creatures, and I'll be back next week for another installment. When the facade drops on this innocent-looking monkey, it reveals vicious claws and fangs, as well as eyes that hold nothing but malice. Space 2.5 ft.; Reach 2.5 ft. Languages Common, Gnome, Infernal, Sylvan; telepathy 60 ft.
Curse of Subservience (Su) bite—injury; save Will DC 17; frequency 1/week; effect 1d4 Wis drain and victim automatically fails Will saves against the akumasaru’s spell-like abilities. An akumasaru can only apply this curse to one victim; if something frees the victim from the curse, the akumasaru becomes instantly aware of this. Poison (Ex) claws—injury; save Fort DC 15; frequency 1/round for 6 rounds; effect 1d2 Wis and Cha; cure 2 consecutive saves. 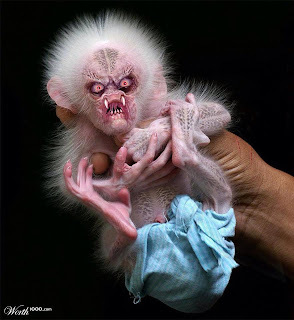 An akumasaru is a monkey-like creature from Hell that delights in controlling humanoids and leading them to increasingly self-destructive acts. An akumasaru measures a mere foot in length, including its 4-inch long tail, and weighs two pounds. Hunted and tormented in Hell, an akumasaru happily escapes its miserable existence when an interplanar portal leading to the Material Plane opens up. The creature immediately looks for safety in the form of a suitable, easily manipulated humanoid who will take it as a “pet.” An akumasaru that first arrives does not understand how unsettling its appearance is to the local populace, but its abilities to detect thoughts and shapechange quickly allow it to assume a more pleasing form. It acts playful when it finds a victim and puts on an act where it accidentally bites its new owner in order to inflict a curse of subservience. In due time, the unfortunate victim will carry the akumasaru around and become overprotective of the creature. After a few weeks of this, the akumasaru goes from feeling secure to feeling complacent and finally to boredom, at which point its curse has made its victim highly suggestible. The akumasaru suggests that its “owner” perform bizarre acts, each more dangerous than the last, until the creature’s victim perishes. A troop of established akumasaru plays a sadistic game where they invade a village and the individual creatures latch onto as many villagers as they can. They then work to drive out those who resisted their influence—or surplus villagers in the case where there are more inhabitants than akumasaru. Then, for their amusement, the akumasaru divide up the village into factions and coerce the villagers to fight each other to the death. After wiping out the village, the akumasaru force the survivors to travel to another community where they can start their game over again. Liquid flows out of an open vial and forms into a tiny dragon; mere seconds after it emerges, almost completely solidifies, with the exception of moisture dripping from its claws, fangs and tail. Speed 10 ft., fly 30 ft. (good), swim 20 ft. Apply Potion (Ex) A flask kaida can store a single potion within itself (either one it drinks or one it creates with Brew Poison); it can feed this potion to a willing or unconscious creature as a full-round action. Poison (Ex) Due to exposure to a variety of liquids, including poisons, a flask kaida can poison a foe using any injury poison. The frequency, effects, and cure remain unchanged, but the Fortitude save DC is based on the kaida’s Constitution (a typical flask kaida requires a DC 14 Fort save). Spray (Ex) A flask kaida can spew stored water in a 20-foot line at an opponent. This deals 2d6 bludgeoning damage (DC 14 Reflex save for half), and a victim who fails his Reflex save is stunned for 1 round. The kaida can use this ability once every 1d4 rounds. A flask kaida charges itself with the protection of potions and other liquids. It makes its home in the same places as the fluids it protects and takes on the properties of those fluids. When it is fully exposed to air, it gains a solid shell around its otherwise liquid body; this shell varies in color depending on the liquid it guards, but it always measures 1-foot in length from snout to tail. The shells adds no appreciable weight to the dragon, so it weighs as much as a typical potion. This odd dragon finds a home in alchemist laboratories or other places where any sort of brewing takes place. Having accumulated a fair bit of knowledge regarding the potion production, a flask kaida enjoys working with skilled craftspeople to create new formulas. A flask kaida sometimes travels with those it enjoys working with, and it provides a boon to its erstwhile companions with its ability to create water seemingly out of nothing. A flask kaida might pair up with a page kaida where the latter provides arcane formulae to the former, so it can brew new potions from spells it had not previously been exposed to. This species of kaida is friendlier than others, but it still desires a lot of time alone in its container. A well-adjusted flask kaida can thrive for 250 years before dissolving utterly—usually breaking down into a powerful potion at the time of its death. A spellcaster can choose a flask kaida as a familiar. The spellcaster must be at least caster level 7th, have the Improved Familiar feat, and provide a potion containing a 2nd-level or higher effect. The kaida usually requires a container where it can rest or assume liquid form.